Brand look and feel – A fun, hip brand personality was expressed throughout the concept. 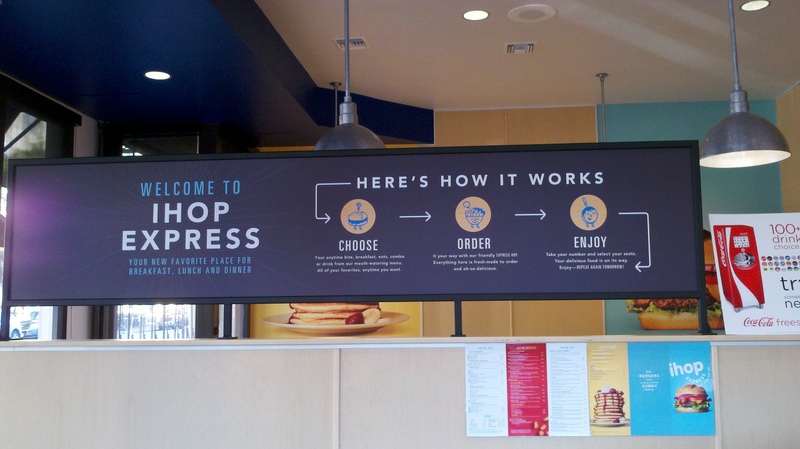 From the signage to the “Flip Kitchen” moniker to the décor and fixtures to the table stands to the crew uniforms, ihop express came across as smart, funny, and stylish. Menu – This wasn’t the standard pancake and waffles menu. 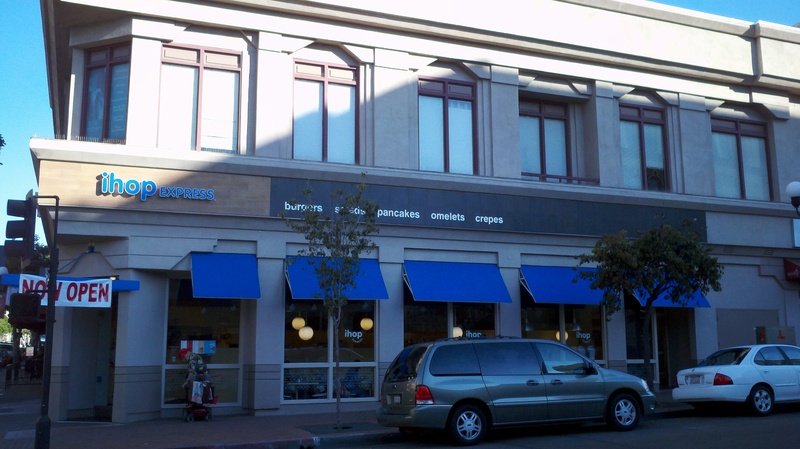 In addition to those standbys, the menu included hearty egg dishes, creative sides like “Crepettes” and “Cup O’ Pancakes,” and full lunch and dinner offerings such as Paninis and ciabatta sandwiches. Ingredients and combinations seemed trend right and branded offerings like Arizona Ice Teas in cans were a great fit for the brand. 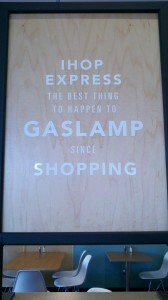 Location – San Diego’s famed Gaslamp area has a flourishing nightlife and is popular among tourists. 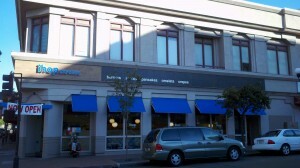 The location seems perfect for attracting late-night diners and hotel guests alike. Food – The food quality and preparation were just OK — not nearly as exceptional as the brand. The Dough Bites were a little doughy and the strawberries on the Rooty Tooty Fresh n’ Fruity Pancakse were still frozen. A little more attention to detail should fix these issues. Details – Speaking of details, two disconnects stood out. 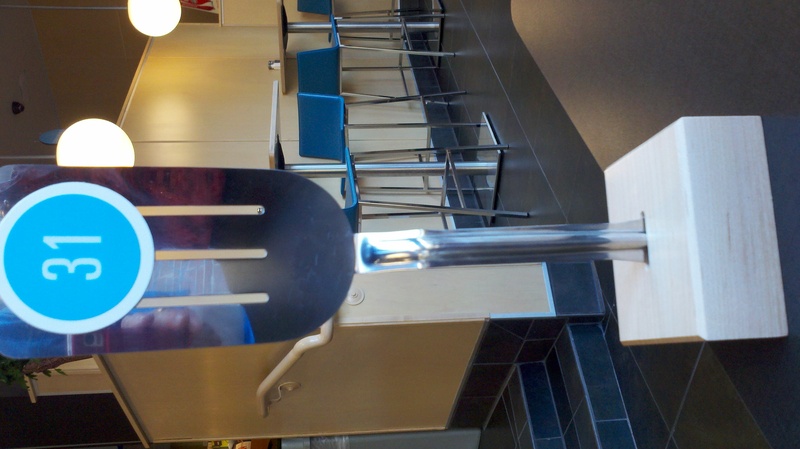 First, plastic utensils detracted from the value perceptions of the experience, not to mention made it hard to eat. Also, the coffee bar counter that seems intended for the stay-awhile-and-work-on-your-computer crowd needs to have convenient electrical outlets. Neither of these are deal-breakers, but the details do matter. 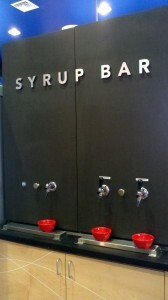 Syrup bar – The Syrup bar concept is a brilliant idea but the execution was half baked. Only two kinds of syrups were offered and each was dispensed from separate spigots. 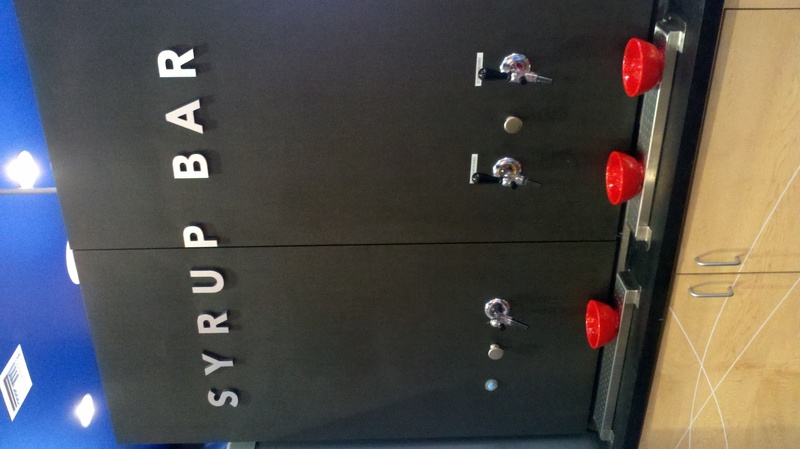 A true “bar” with several different types of syrup and the option to mix them (a la Coke Freestyle) would have been more consistent with the fun brand personality and a more memorable, distinctive experience. 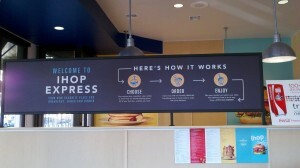 The name – “ihop express” undersells this concept, as it only connotes a scaled-down, sped-up version of the full-service chain. 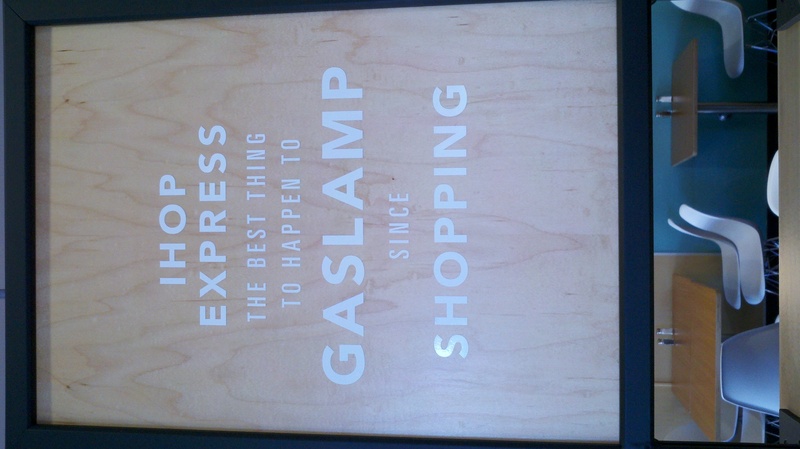 Instead the name should evoke the fresh, distinctive personality of the concept. For the Millennial target, the concept appeal has less to do with the speed of service and more the relevant brand and menu. Also most people don’t associate IHOP with lunch and dinner (even if the chain has been serving food for these meal occasions for ages) and so there’s an opportunity for the name to promote the full menu/multiple occasions. 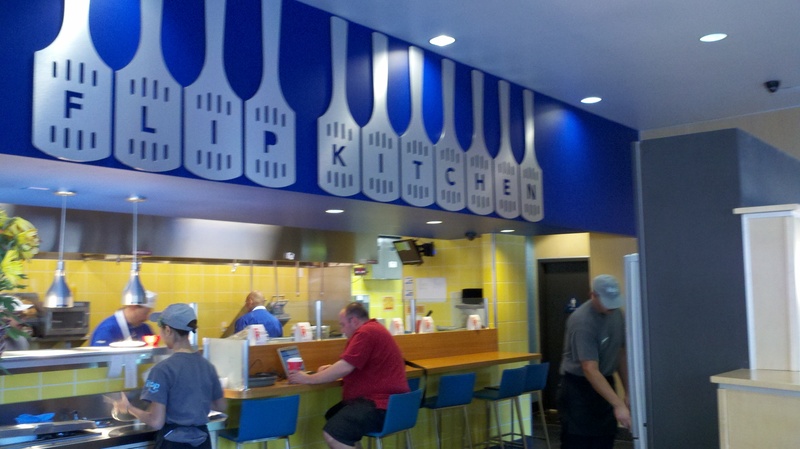 Flip Kitchen, the name of the kitchen area, seems like a great option – perhaps using an endorser brand approach to link it to the parent ihop brand, “Flip Kitchen by ihop” would work. 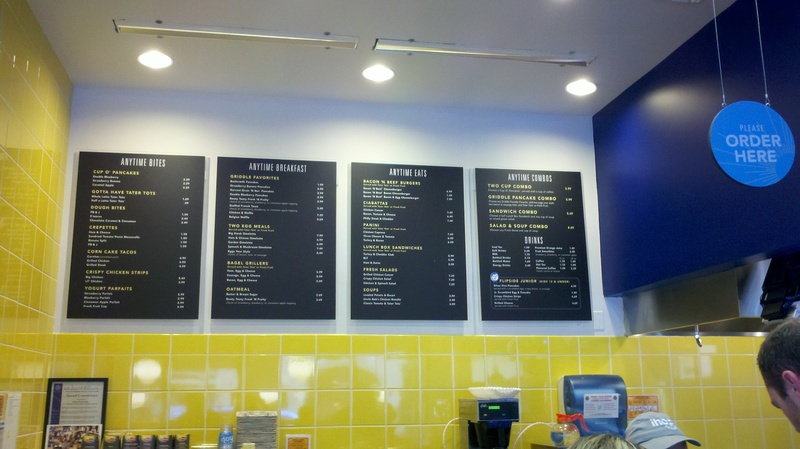 Alternatively, “ihop eatery” suggests a full menu with a retro-cool feel. 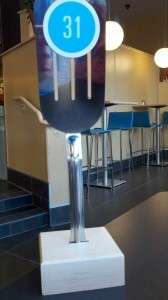 Bottom line: The concept has a lot of potential – and certainly more appeal than the chain’s core concept.